Decks add value to your home because they add comfort for your family while you live there and provide the same added comfort to the next family should you ever decide to sell. Further, the deck is essentially an additional room on your house when the weather allows you to spend time outdoors. Whether you enjoy privately sunbathing with a book or entertaining guests, the deck provides the space you need to fully enjoy your house as a home. The traditional deck is a fairly basic addition to your house. It's a floor of comparable size to the indoor rooms with a safety railing and steps leading out to the yard. It holds your grill for cooking outdoors on occasion along with some chairs and tables according to the needs you and your family have. Anybody who has children who play outside understands a particular function of the deck to hose the kids off before wrapping them in a towel and sending them in for a formal bath. After washing up, they're greeted on the same deck with the wonderful smell of a grill and their dinner prepared and waiting for them. Unlike your children, when your friends come to visit they have already bathed and enjoy the fresh air and smell of food slowly cooking over a nice outdoor grill. By using the deck as a space for guests to congregate, you don't have the chore of cleaning up your living room after they leave. Customization to your deck is limitless. You can have built in seating and tables or a full outdoor kitchen. Depending on how close you are with the friends you entertain, a hot tub may be a welcome addition. Planter and workbenches are perennial favorites as is a filtered tap to provide drinking water without having to go inside. The sky is the limit to how an experienced contractor can build your deck. 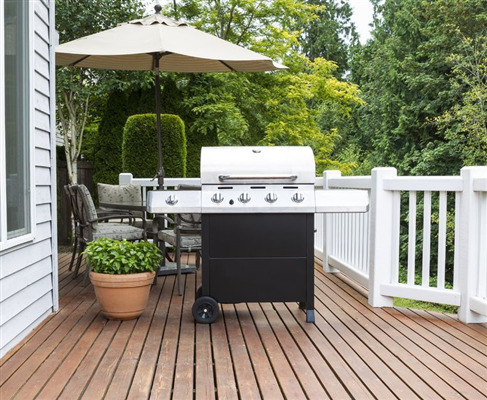 Whether you plan to sell the house this year or 25 years from now, a deck is essential to the value of the home. The basic deck is expected by potential buyers. The custom deck is appreciated. Even if the buyer isn't an outdoor person who intends to use the deck as much as you did, they will appreciate the value and recognize how well you took care of the house by simply building such a structure. You simply can't go wrong when you put the time and thought into building a deck for your home, whether it's for your own personal comfort or to add value towards a long term investment.